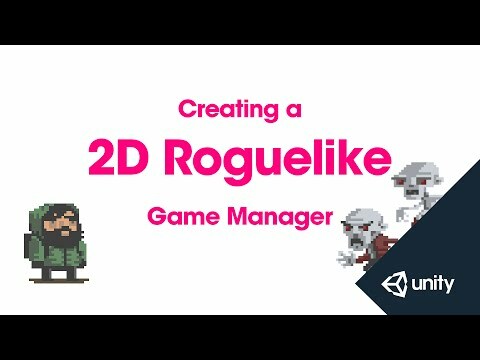 This is part 5 of 14 of the 2D Roguelike tutorial in which we write the GameManager script which will manage the state of our game. test the BoardManager script that we just wrote. Next let's open our game manager script in MonoDevelop. of the type int called Level and initialise it to 3.
level 3 because that's where the enemies appear. We'll change Start to Awake. In Awake we're going to do two things. And we're also going to call the InItGame function. is so that it can determine the number of enemies. With that done let's save our script and return to the editor. the variables of our BoardManager script. and drag them in to our arrays here. Let's lock the inspector by clicking the lock button up here. the exit, because that's first. on to the floor tiles array. Next we'll do the wall tiles. Select Wall1, shift-click on Wall8. Drag them to the Wall Tiles array. on the soda prefab because I'm on a Mac. to add to the selection. We'll drag those to our Food Tiles array. Let's grab our two enemy tiles. And finally our outer wall tiles. and give it a test. so let's just fix that quickly. We'll set the X to 3.5 and the Y to 3.5. We'll also set the background to black. and our enemies being spawned as well. We're going to add some functionality to our GameManager script. To make our GameManager what's called a singleton. Let's open the GameManager in MonoDevelop. and initialise it to null. that it will be accessible from outside the class. an instance of the class. from any script in our game. we're going to assign it to this. with two instances of our GameManager. game objects in the hierarchy will be destroyed. we don't want it to be destroyed at that point. to make sure that it will persist between scenes. Let's save our script and return to the editor. Prefabs folder to create a prefab. GameManager when the game starts. a new script called Loader. instantiate one from our prefabs. We're going to change our Start to an Awake. and accessing it from our Loader script. We can delete the update function because we're not going to use it. And that's all we need for now. Now in the editor we can delete our GameManager from the hierarchy. And add our Loader script to the main camera. Now we can test our scene. it's time to get our units moving around. called MovingObject to do that. using System.Collections.Generic;       //Allows us to use Lists. public static GameManager instance = null;              //Static instance of GameManager which allows it to be accessed by any other script. private BoardManager boardScript;                       //Store a reference to our BoardManager which will set up the level. private int level = 3;                                  //Current level number, expressed in game as "Day 1". //Then destroy this. This enforces our singleton pattern, meaning there can only ever be one instance of a GameManager. //Initializes the game for each level. //Call the SetupScene function of the BoardManager script, pass it current level number. //Update is called every frame. public GameObject gameManager;          //GameManager prefab to instantiate. public GameObject soundManager;         //SoundManager prefab to instantiate.